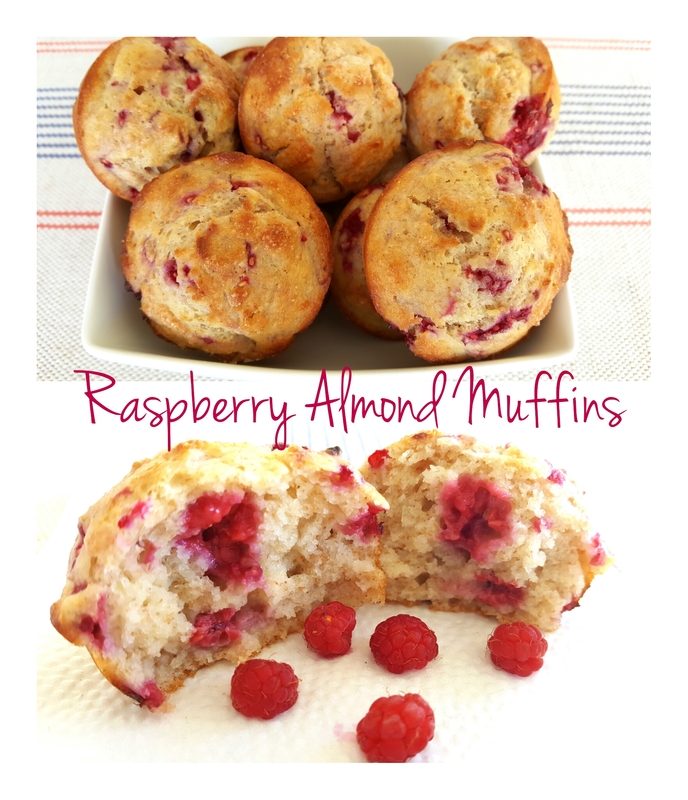 A healthier raspberry muffin made with apple sauce, almond milk, yogurt, coconut oil and whole wheat flour. 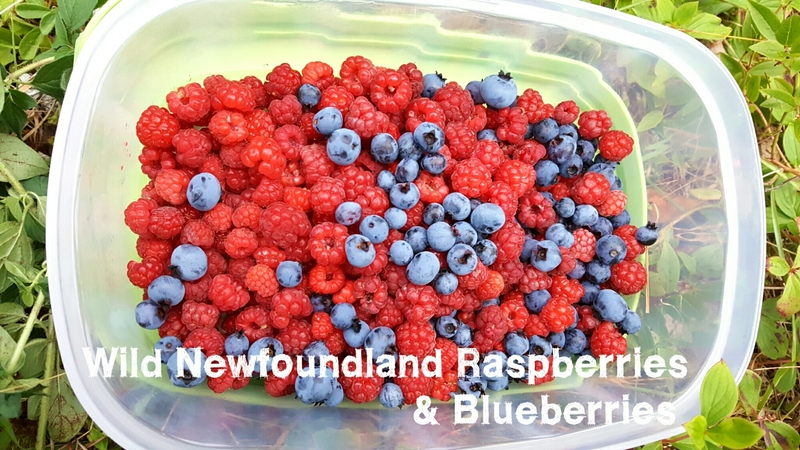 Very moist with a slight almond flavor and big pops of Wild Newfoundland Raspberries! About a week and a bit ago, I went to check on my “Secret” berry patch. “My” berries were still not ripe enough yet so I planned to check back in another week. So the other day, I was just finishing my workout in the gym and my husband was working on his quad (4 wheeler) down by the ocean. He calls me down and says that a guy on another quad just went by and then suddenly stopped. I knew immediately that my “secret” spot had been discovered. I slowly walked over, and sure enough, there he was picking my berries!!! I could not believe it…did he not know this was my spot and that I had been picking here for the last 3 years and I needed those berries to make some delicious muffins!! The nerve. So being me and never one to back down, off to the house I go to throw on my ball hat (incognito) and my rubber boots (never know what you are going to step in!) and off I go with my tupperware container. My husband just laughed and shook his head saying “I guess he’s not getting all the berries!” Luckily the berry stealer is already gone and he didn’t discover my raspberries but found a ripe patch of my blueberries instead! So I picked whatever raspberries I could before he decided to come back! In large mixing bowl, add whole wheat flour, all purpose flour, baking soda, baking powder and salt. Stir to combine and set aside. In another bowl, add coconut oil and sugar, stir to combine then add apple sauce. Stir to combine. Add egg and stir until smooth. Add Greek yogurt, almond milk, and almond extract and stir until combined. Add wet ingredients to the dry ingredients and stir just until combined. Gently fold in raspberries. 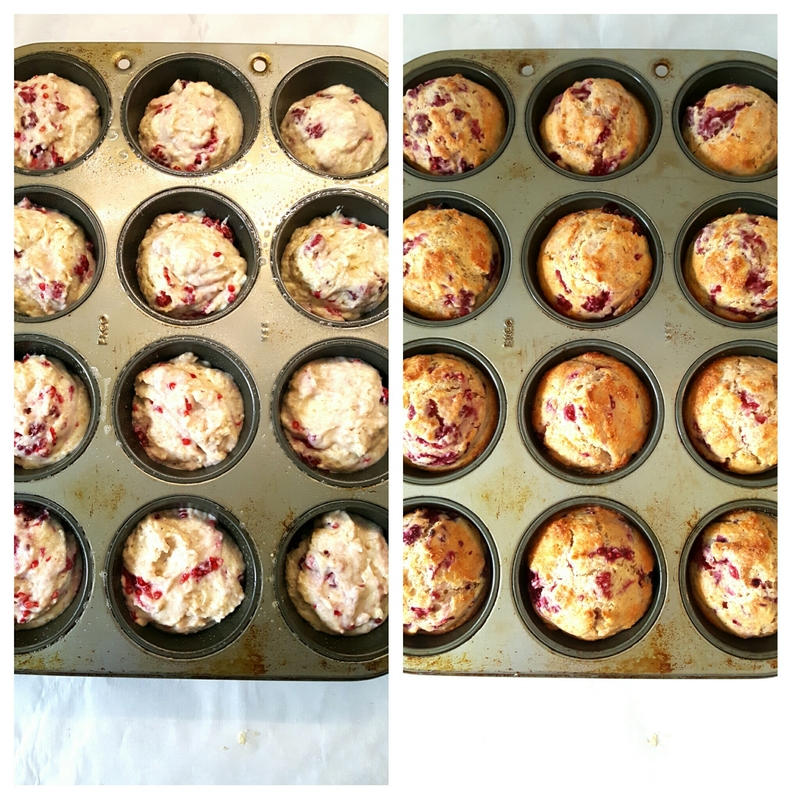 Using an ice cream scoop, evenly fill muffin pan. Tap pan to remove air bubbles. NOTES: My raspberries were really small so I left them whole but if they are large, slice in half. Raspberries are super delicate so fold in as gently as possible. These muffins freeze beautifully so make a double batch and keep them in the freezer! If you don’t have coconut oil or almond milk, just use canola oil and fresh milk. If you don’t have applesauce, use another 1/4 cup of oil. It’s amazing that you can find wild berries just out there in the wild. Glad there was enough for everyone. 🙂 Your muffins look nice and fluffy and tasty! Thanks for sharing.